We love having groups come on tour with us! 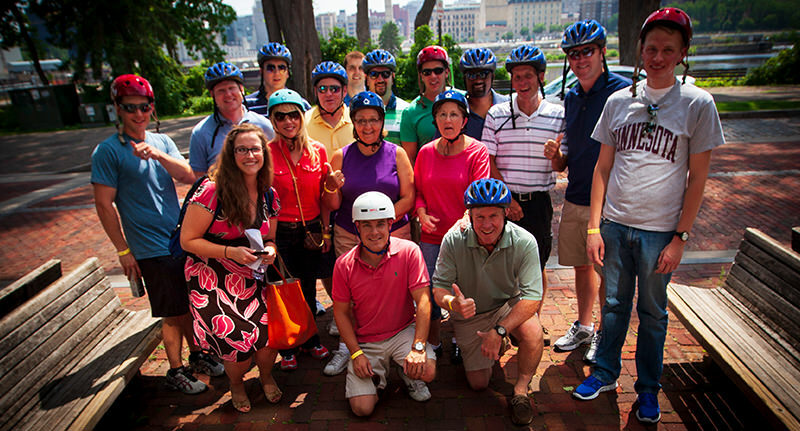 Bring your corporate, school, or social group of any size to experience the city on a HumanOnaStick Segway Tour! We are able to accommodate 80+ riders at one time on our most popular Minneapolis History Tour. 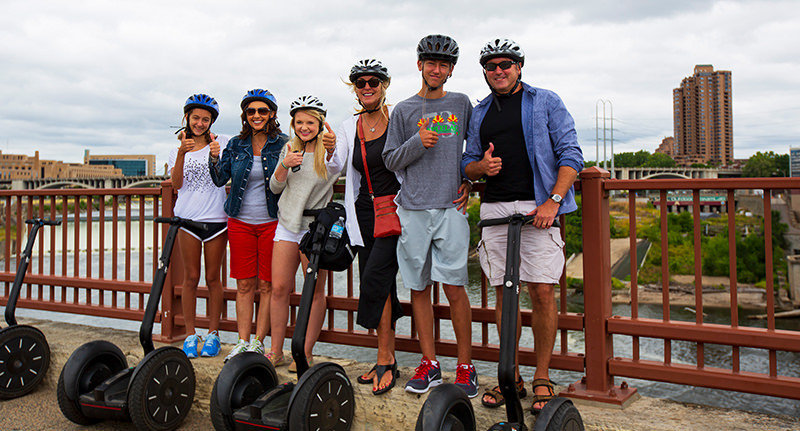 Great for company outings, celebrations, or team-building events, we can work with your schedule to create a great Segway Tour experience! Nowhere else can you bring this many riders on one Segway Tour. If you are interested in us coming to your corporate venue, we can provide mini-tours to over 2000 riders at your event. Call 952-888-9200 for more information. Looking for a fresh idea for a birthday party? Want to give a unique anniversary gift? Looking for a new, exciting way to spend time with your family? We can do a private tour for the whole gang! Groups of 12 or more qualify for a private tour with a custom start and end time to your group’s liking. Call 952-888-9200 for more information. Segway tours are a great way to take learning outside the classroom! Both fun and educational, our tours are perfect for field trips, senior outings and everything in between. Students will never forget this unique experience! Riders must be at least 12 years old. Call 952-888-9200 for more information. Or… want a special tour for a small group? With groups under 12, we are able to create a private tour catered just for you! We can adjust the route, length of tour and content to fit your needs. Call 952-888-9200 for more information. Narrative delivered by lead tour guide. Snack and beverage at midpoint of the tour. Helmet to use during the tour. Mill City Museum entrance ticket. 25% off coupon for Pracna on Main. Nearby event and meeting space. Ages 12-80 are welcome with a weight restriction of 290 lbs. All riders are required to wear helmets. Anyone under the age of 18 must be accompanied by an adult during the duration of the tour. For groups over 30 we split the group into smaller teams (minimal stagger times). Each team has a lead guide who provides the historical content of the tour as well as the appropriate number of helper guides. This allows for more one-on-one interactions with the staff as well as creating a safer tour environment. Depending on the size of the group, we may ask that you divide participants into groups before arrival to facilitate the check-in process. Please view our cancellation policy and our weather policy.